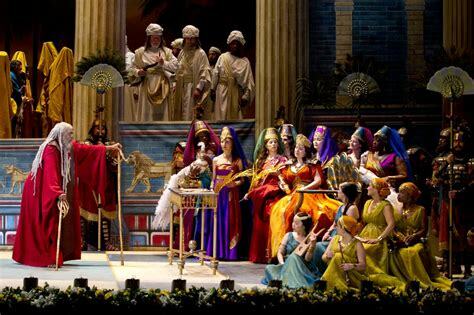 On Sunday, March 11 we will watch Nabucco from the Metropolitan Opera Catalog of live performances. Nabucco tells the story of an aging king who descends into madness while his bloodthirsty daughter begins a reign of terror, leaving a defenseless populace to battle for freedom from their oppressors. A monumental opera that made Verdi a national hero, Nabucco boasts a bold score that goes straight to the heart, highlighted by the immortal chorus (Va, Pensiero) of the Hebrew slaves. The powerful tale is loosely based on the historical and biblical figure of Nebuchadnezzar, a mighty king whose madness is cured by divine intervention, as told in the Book of Daniel. The opera which catapulted Verdi into international fame as an opera composer came after he had sworn off writing opera following a dismal failure and the tragic loss of his two infant children and his wife.